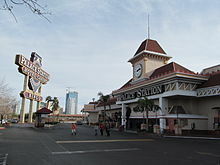 Palace Station is a hotel and casino located in Las Vegas, Nevada. It is owned and operated by Station Casinos and has 1,053 rooms. Palace Station has a large Asian customer base because of its location near Chinatown. In 1976, Frank Fertitta, Jr., a former general manager at the Fremont, and his two partners, opened The Casino, a 5,000 sq ft gambling hall attached to a Mini Price Motor Inn, in an off-Strip location where few observers expected it to succeed. In 1977, he added bingo and renamed the property as the Bingo Palace. The casino was the first to target a clientele of local residents with offerings like giveaways, cheap buffets and bingo. It thrived, and Fertitta soon bought out his partners' shares. Other locals casinos like Sam's Town and the Gold Coast followed in later years. In 1984, the Bingo Palace was expanded and remodeled with a railroad theme, and renamed to the Palace Station Hotel & Casino. The grand opening ceremony was held on April 6, featuring Governor Richard Bryan and the historic locomotive Inyo. A train-themed neon sign, measuring 126 feet wide and high, was constructed for Palace Station. In 1985, Fertitta purchased the adjoining 465-room motel. A 21-story hotel tower and high-rise parking garage were added in 1990, bringing the room count to 1,041. In 1993, Fertitta bought the land for what would become Boulder Station, the beginning of an expansion that would grow Station Casinos into a billion dollar company. But Fertitta left the firm that same year, turning management over to his sons when it went public. The hotel has seen its share of accidents and misadventures, including a cashier's cage robbery in 1992, a 21st-floor fire caused by lightning in 1998, an armored car robbery in the parking lot in 2009 and most notoriously, the 2007 robbery of sports memorabilia by O. J. Simpson and his associates. Early in 2009, Improv Vegas opened at the Bonkerz Comedy Club which was renamed from the Sound Trax lounge. The tower rooms have recently been remodeled. On October 17, 2016, employees voted to narrowly reject the unionization of a hotel and casino property by 266 to 262. It was organized by the Bartenders Union and the Culinary Workers Union. It was the first and only Station Casinos property to not be unionized by a vote margin. On March 13, 2017, Station Casinos agreed to settle disputes with the National Labor Relations Board (NLRB) under the Trump administration by letting these employees, the Bartenders Union and the Culinary Workers Union to unionize the property. It is the third Station Casinos property to be unionized. A $192 million renovation began in fall 2016, and was completed two years later. Palace Station remained open during renovations. As part of the renovation, the Palace Station's train theme was removed in favor of a modern design. Eight faux locomotives on the front of the building were removed, and one was donated to the city's Neon Museum, along with a Palace Station neon sign measuring 50 feet long. The 126-foot Palace Station sign was removed during 2018, marking the end of the train theme. Palace Station's motel portion, with approximately 447 rooms, was demolished as part of the renovation project. A new bingo room opened during 2017. A grand re-opening celebration, including a fireworks show, was held on September 1, 2018. The 220,000 sq ft (20,000 m2) addition included 500 additional slot machines and a 300-space parking lot on the property's east side. The renovation also featured four new restaurants, including a revamped buffet. A movie theater, part of the renovation project, is scheduled for completion in December 2018. ^ "Listing of Financial Statements Square Footage (2017 data)". Nevada Gaming Control Board. March 6, 2018. p. 7. Retrieved September 5, 2018. ^ a b Simich, Jerry L.; Wright, Thomas C. (2005). The Peoples of Las Vegas: One City, Many Faces. University of Nevada Press. pp. 155–156. ISBN 978-0-87417-616-2. Retrieved September 15, 2011. ^ a b Powers, Ashley (August 23, 2009). "Frank Fertitta Jr. dies at 70; pioneer of Las Vegas' neighborhood casinos". Los Angeles Times. Retrieved September 15, 2011. ^ a b Benston, Liz (December 23, 2005). "Neighborhood Draw". Las Vegas Sun. Retrieved September 15, 2011. ^ Snedeker, Lisa (December 19, 2001). "Las Vegas gambling empire catering to locals with bingo, parking spaces". Pittsburgh Post-Gazette. Retrieved September 15, 2011. ^ a b Gottdiener, Mark; Collins, Claudia; Dickens, David R. (January 10, 2000). Las Vegas: The Social Production of an All-American City. Wiley-Blackwell. pp. 204–205. ISBN 978-1-57718-137-8. Retrieved September 15, 2011. ^ a b c d Akers, Mick (April 30, 2018). "Dismantling of Palace Station sign signals the end of a theme". Las Vegas Sun. Retrieved September 5, 2018. ^ "Camera tapes being enhanced in probe of $1.1 million Vegas heist". Deseret News. Associated Press. April 9, 1992. Retrieved September 15, 2011. ^ Zekan, Karen (July 20, 1998). "Officials say lightning likely cause of Palace Station blaze". Las Vegas Sun. Retrieved September 15, 2011. ^ "Vegas armored car heist not so lucrative". United Press International. December 14, 2009. Retrieved September 15, 2011. ^ Haynes, Brian (October 4, 2008). "O.J. Simpson guilty". Las Vegas Review-Journal. Retrieved September 15, 2011. ^ Katsilometes, John (April 24, 2009). "Star-crossed Turner gives Vegas one more shot at the Hilton's Shimmer Cabaret". Las Vegas Sun. Retrieved May 12, 2009. ^ Fink, Jerry (April 29, 2009). "Improv theater in new setting, not that it matters". Las Vegas Sun. Retrieved May 12, 2009. ^ Velotta, Richard N. (October 17, 2016). "Palace Station employees narrowly defeat Culinary union vote". Las Vegas Review-Journal. Retrieved October 23, 2016. ^ Moore, Thomas (March 14, 2017). "Deal sets stage for Palace Station workers to unionize". Las Vegas Sun. Retrieved March 15, 2017. ^ Velotta, Richard N. (March 15, 2017). "Culinary to begin bargaining talks with Palace Station". Las Vegas Review-Journal. Retrieved March 15, 2017. ^ a b c Moore, Thomas (March 21, 2017). "Train leaving the Station: Railroad theme jettisoned in Palace Station's renovation". Las Vegas Sun. Retrieved September 5, 2018. ^ Radke, Brock (March 8, 2018). "Don't sleep on Palace Station's massive upgrade". Las Vegas Weekly. Retrieved September 5, 2018. ^ a b Hart, Gabby (September 1, 2018). "Palace Station celebrates grand re-opening after $192 million in renovations". KSNV. Retrieved September 5, 2018. ^ a b c Velotta, Richard N. (June 20, 2018). "Palace Station's $192M upgrade expands casino, adds restaurants". Las Vegas Review-Journal. Retrieved September 5, 2018. ^ a b c Moore, Thomas (July 25, 2017). "Upgrades at Palace Station could include convention center". VegasInc.com. Retrieved September 5, 2018. ^ a b Curtis, Anthony (September 1, 2018). "Palace Station makeover unveiled". Honolulu Star-Advertiser. Retrieved September 5, 2018. ^ "Grand Reopening of Palace Station". Las Vegas Sun. September 1, 2018. Retrieved September 5, 2018. ^ Akers, Mick (June 21, 2018). "Photos: Palace Station's 2-year modernization project is almost done. Here's a look". Las Vegas Sun. Retrieved September 5, 2018. Wikimedia Commons has media related to Palace Station.